This is my official entry to LEVY’s contest. According to dictionary.com, “levitate” means “to rise or cause to rise and float in the air, without visible agency, attributed, esp formerly, to supernatural causes.” Whoa, that’s a bit scary! Well, I don’t levitate, I don’t know how to levitate, and I don’t intend to learn how to levitate, but I’m joining Levy’s LEVYTATE contest, which I knows means something positive. “Levytate” here means being on cloud 9 or being in a state of blissful happiness. Now, that’s something I want and something I have personally experienced. 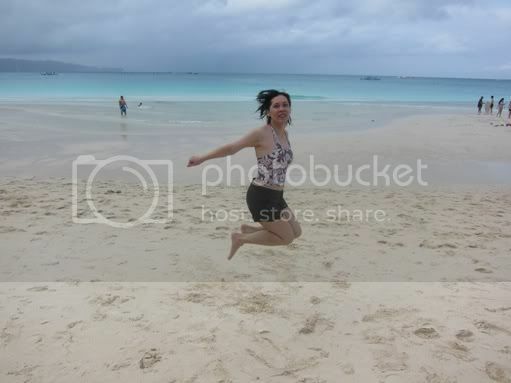 First, here’s my jump shot, one of the requirements of Levy’s contest. I’ve written in my previous posts about the family crisis we had last year. Nanay, my mother, was diagnosed with coronary artery disease with 80 to 90% of her heart blocked, and she needed an open-heart surgery asap or she might suffer a heart attack anytime. The cheapest medical package we got from the Philippine Heart Center was a little more than Php400.000.00, but that was still too big an amount for us to shoulder. We almost gave up hope and was close to accepting the fact that Nanay could die anytime because we couldn’t afford the operation. But God was good to us. We started emailing family, friends, office mates, our bosses and church mates for financial assistance! Monetary donations started trickling in. Every day since then was a countdown to save our Nanay’s life, and every day we gave updates to our Tatay of how much money came in and how much more we needed to raise for Nanay’s surgery. When we finally told Tatay that we might be able to raise the needed amount after all, he cried. That was the first time in all of my 30+ years that I’ve seen my father cry. We were all praying for a miracle, and what we prayed for was given to us! The generosity of all these wonderful people amounted to more than Php200,000.00. We couldn’t believe what was happening! We had to take out a loan for the rest of the money that was needed for Nanay’s surgery, and finally on June 9, 2010, Nanay underwent quadruple bypass surgery at the Philippine Heart Center. This entry was posted in Blog Contest, Heart Bypass Surgery. Bookmark the permalink. That is a sure way to make you levitate….God’s amazing grace and healing power. Just like yeast, when affliction comes upon us, we rise —and most often , it results blessings that make us levitate. That must be a levitating moment. You and your family are blessed to have wonderful friends around. it’a a “levytating” experience to feel GOD’S Gracious Hands and Undying Love upon our lives..
Everyone could have that levitating moment as long as we believe. God works in mysterious ways and we just have to be faithful to Him. the LORD has lavished us with HIS love and our response was to “LEVITATE for HIS glory alone! God is so good!… HE’s always on time for our needs that’s why let’s always be in the attitude of Levitating with HIS goodness. You really have all the reasons to levitate!! God is great! This is good news! Glad to read about your nanay’s road to recovery. You are indeed blessed to have such generous friends and relatives. God is truly awesome for providing for your mom’s operation. All glory belongs to our dear LORD for you to have this levitating story. Kaya no questions asked talaga ako pag kayo palarin sa contest na’to. Good luck po…. at sa ating laha na rin, haha! Having our parents live longer in this earth is what every child wishes for. 🙂 It certainly is worth levitating for. Well , I can say that levitating is high form of joy. You can feel it when you know that it is impossible to solve it but God will make a way to help you to ease the heavily burden you shouldered. Praise the Lord for all the blessings He gave to us. ← The Ipanema GB Butterfly Collection Is Here!